The rebirth of the Iranian National Ballet in the form of Les Ballets Persans ( LBP), based in Sweden is the result of five years of steadfast determination to realize what was once nothing more than a beautiful dream. 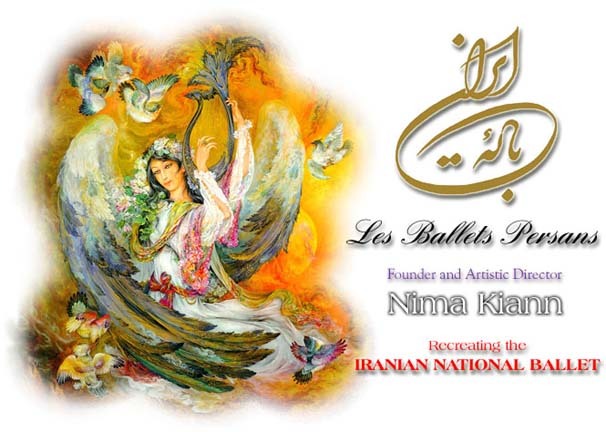 "From the very first days of my ballet education I was determined to one day use this old Western art form to present Iranian culture and arts," says Nima Kiann, founder and director of LBP, also known as "The New Iranian National Ballet". Nima Kiann was born in Tehran in 1970 where at the age of 14 he began his studies in painting, Persian Calligraphy and graphics at the School of Visual Arts . Shortly after arriving in Sweden in 1989, his burning desire for dance compelled him to begin his education in classical and contemporary dance at the Gothenburg Ballet Academy. He later continued his education in Cannes, France, at the Centre de Danse International de Rossella Hightower. He has since pursued his education in dance by participating in various ballet master classes throughout Europe. According to Nima Kiann, one of the major influences in his artistic life was the music of Hossein Alizadeh, one of the greatest of contemporary Iranian traditional composers and musicians. "It was around the same time of leaving my homeland at the age of eighteen, that I was introduced to the music of Alizadeh. I found his music extraordinarily powerful, and remember vividly what a major role it played in influencing me to embody a great vision, which at the time seemed so unlikely, would one day materialize. I could never have imagined that the dream which found its source of inspiration in the music of this Persian master, and which pre occupied my mind for so many years would gradually evolve into this artistic and cultural accomplishment." Trying to set up the company back in 1998 was nevertheless far from being an easy task, but Kiann likes challenges. I knew from the start that in order to make this dream come true I had to have steadfast determination," says Kiann with a smile. "The path that led us here has not been an easy one. Had it not been because of my deep affection for the rich heritage of my native homeland, combined with my fascination for ballet, I don't think I would have found the strength necessary to overcome all the difficulties I was confronted with. " To begin with Kiann was disappointed to encounter minimal interest on behalf of some of the veterans of Iranian ballet and dance. However thanks to his personal acquaintances with individuals and institutions from all around the world who showed great enthusiasm for his ideas, and whose assistance proved invaluable, he was able to rejuvenate his energy and faith in the project. "Another motor for me," says Kiann, "was the conviction that through my project I could contribute to a form of international dialogue through my art which has become even more vital today in our ever changing world. A dialogue to mend differences where there is a need, while on the other hand promote tolerance, and also an appreciation for the positive aspects of diversity. To emphasize commonalties and similarities should be yet another important objective. What better instrument of diplomacy with such multinational qualities could be more effective in achieving all of the above than a dialogue through the arts?" Kiann believes that whether in the form of fine arts, music or dance, art is the one element of human expression which transcends all conventions that traditionally have limited human communication and integration. Neither languages nor borders can easily pose obstacles for this form of interaction. Kiann continues: "One of the most exciting accomplishments in creating LBP was the establishment of new Iranian and Azerbaijani artists, which reflect the strong historical and cultural ties that exist between our two countries. I truly feel that I found a great treasure in the Azerbaijan's ballets, which embody the bonds between the cultures of Iran and Azerbaijan." This vision led to acquaintances with two renowned artists of Azerbaijan ballet: Rafiga Akhundova, and Maskud Mamedov, who are among the greatest choreographers of the Near and Middle East. Through their discussions they found an interest in a rarely performed ballet, composed by Akshin Alizadeh, called "Babek", which premiered in Baku in 1985. However, after a few performances "Babek" was excluded from the repertoire of Baku Opera and has been never been staged anywhere in the world before LBP revived this forgotten production. It was therefore decided to allow this Azerbaijani production created independently by Azerbaijani artists to perform on stage with the LBP company. The plot of "Babek" resembles the uprising of Spartacus and evolves around the character of Babek Khorram-Din the Legendary herdsman and warrior who was determined to defeat the occupying forces of the Caliphate in the late 5th and early 6th centuries, is without doubt one of the most heroic figures in Iranian History. "Babek" proved to serve as a good example of how the dramatic properties of Iran's and Azerbaijan's rich heritage of epic literature can complement Western classical Ballet in its artistic and emotional expression. Upon the success of this adaptation, Kiann's focus has been to present a repertoire that encompasses various periods of Iranian history, ranging from the era of the Sassanid dynasty up to modern times. Thus "The Seven Beauties" by Kara Karaev, based on Nezami Gangavi's Haft Peykar, is being performed as well as , "La Femme" and "Divine Banquet" choreographed by Kiann himself. "La Femme" is a short modern ballet in honor of Iranian Women and presents three different themes. The first expresses the pain and suffering endured through the centuries. The second celebrates their femininity, grace and beauty, while the third depicts the courageous struggle for their rights and emancipation. Hossein Alizadeh whom Kiann admired from his school days, is the composer of the music which was used for creating "La Femme". "Divine Banquet" is on the other hand a Sufi spiritual dance ritual, called "Sama". To bring this ambitious repertoire on stage, Kiann has been able to mobilize the artistic abilities of about 20 young talented dancers. In all, more than 106 dancers, musicians, costume and set designers, as well as technical and artistic coordinators from 22 countries have worked on this prestigious project ranging from these . It is therefore with pride and confidence that after five years of struggle and hard work that LBP gave its premiere on October 7th, 2002 at the Royal Cirkus Hall in Stockholm. The performance was highly appreciated by the audience and critics and the ballet was then due to give similar performances in three other Swedish cities before going on tour to major venues in Norway, Denmark and Germany. Unfortunately and ironically due to the participation of Azerbaijani artists within an Iranian/Persian ballet structure, this performance (and only after four performances in Stockholm and Gothenburg) as well as the entire tour was canceled. The tour was also threatened by obscure Iranian Azerbaiji separatists in Sweden and a serious dispute between the Iranian and Azerbaijani governments. The interference by a separatist Iranian Azerbaij minority group in Sweden who has threatened to stop and "sabotage" the performances "with all possible means everywhere" was the reason for discontinuing the Scandinavian tour. Apart from threats by telephone and email, false rumors and absurd political accusations have been spread on flyers distributed to audiences and to the newspapers. "This created a hellish atmosphere around the time of the premiere," says Kiann, "Although it has not been confirmed yet, we heard that people who had tried to buy tickets for the show through the Swedish booking agency 'Ticnet" had wrongly been told that the tickets were sold out, as a result of sabotage by this group"
These actions have led to diplomatic disputes between Sweden and the Republic of Azerbaijan with disastrous effects for the costume makers and other Azerbaijani artists involved in this artistic project, especially the two choreographers (Rafiga Akhundova, and Maskud Mamedov ) who abruptly went back to Baku instead of accompanying the ensemble during the tour as planned. Under these circumstances it became impossible to continue exposing the dancers, audiences and staff to any further risks, dangers and persecutions. The arrest of an Azerbaijani dance troupe in Mashhad, Iran (reported in the media in September 2002) is the origin of this cultural dispute between Iran and Azerbaijan and might be connected with the strange behavior of this separatist Iranian Azerbaijani group. It seems that innocent groups have now become the target for political conflicts. There was also a very strong denial about incorrect information by the Swedish daily Dagens Nyheter stating that the LBP tour was canceled because of a "fiasco". All the performances were a success with standing ovations and great appreciation from audiences. The LBP dancers were of such professionals quality that two of them immediately got contacts with the Royal Swedish Opera Ballet after the first performance. In addition, the company's first production which was based on a collaboration between Azerbaijan and Iranian choreographers and composers fully recognized the Azerbaijan contribution by giving it full credit in all programs and press releases. Kiann observes, "LBP promoted and presented the Azerbaijani ballet for the first time in Scandinavia. No one, not even the Dance Museum in Sweden, had any information about Azerbaijan's National Ballet Company, or any kind of ballet production. I have personally informed institutions such as the Dance Museum in Stockholm, the authors of the Oxford Dictionary of Dance in England, The International Dance Archive in New York about the existence of the 'State Theatre of Opera and Ballet' in Baku... It is therefore very sad for me to see that my contribution and extensive effort to present Azerbaijani ballet in the West was never appreciated. I feel that my good intentions for strengthening the cultural ties between Azerbaijan and Iran were so abused by a political separatist group and the cultural elite of Azerbaijan showed no understanding by reacting so aggressively. " Ever since these sad incidents, protests have been expressed from all over the world both by telephone, mail, and radio against the way that the political minority group mentioned and their allies in the press have unfairly mistreated, threatened and done damage to LBP. Especially valuable is the support from colleagues and artists from more than seventy countries on all five continents who, through the president of the international federation of actors and dancers (FIA), have protested against this new form of cultural terrorism. The enormous support from all over the world is growing every day and \a great demand has already been expressed to take up and expand the tour in several countries in Europe as well as in the US and Canada. Kiann is not giving up. "I will start everything from square one again," he says. "We will try to raise money through international fundraisng. We have a great deal of interest in our work from all over the world, in particular from the US." The good news is that thanks to Kiann's determination, only three weeks after its bankruptcy, the LBP was reorganized and a new registration number was issued for the company. The recognition of the Swedish government and membership in the Swedish Theater Association means that the organization will be treated as one of the well-established dance institutions in Sweden. The recognition of LBP as a representative artistic institution in this country also means simplifying many bureaucratic proceedings. After our telephone conversation I was impressed by Kiann's passion and energy which I must admit was contageous. I found that he is admirable not only as an artist but also as a fellow compatriot who is trying to promote our Persian Culture beyond its traditional frontiers. Kiann says enthusiastically, "What is going to happen in the near future is that during the new year our work will be intensified again. The organization will start its educational activities by arranging ballet courses for Iranian youth and children. A new ballet production is expected but this time Azerbaijani works (not collaborators) will be excluded. From now on the company is dependent on the support from the Iranian community more than ever in order to survive and thrive." Does this article have spelling or other mistakes? Tell me to fix it.